I'm looking at another familiar portion of Scripture this week, this time it is Mark 10:13-16: "People were bringing little children to Jesus for him to place his hands on them, but the disciples rebuked them. When Jesus saw this, he was indignant. He said to them, 'Let the little children come to me, and do not hinder them, for the kingdom of God belongs to such as these. Truly I tell you, anyone who will not receive the kingdom of God like a little child will never enter it.' And he took the children in his arms, placed his hands on them and blessed them." I've always liked this story, this picture of Jesus welcoming little children to Him and scolding his disciples for trying to keep them from bothering Him. Maybe it's because I love kids too and I like that Jesus wanted to take the time to bless them. Maybe it's because I'm a little suspicious of those who view children as nothing but a bother and so it's reassuring to see Jesus treating them with love and respect. Certainly it is because I like the idea of accepting the kingdom as a child accepts things, with a steady and certain faith that what they believe is true. A couple of weeks ago, though, I came across this story in a way that made me think about Jesus' words a little differently. When He said, "anyone who will not receive the kingdom of God like a little child will never enter it," I always focused on accepting the kingdom, as in accepting it for the first time. I took Jesus' words to be about our initial faith in Him, but never really thought about how being like a child would impact our faith in the long term. But then someone pointed out that being like a child includes being dependant. Kids don't provide for themselves, and they don't question whether or not provision will be made for them.They just depend on their parents to take care of them. Likewise, we should be like little children and depend on our Father to take care of us. How much do we like to question His provision, though? We worry and fret about the things we need (and sometimes over the things we only just want), stressing over whether or not we will have enough. Never mind that Jesus tells us specifically not to stress over those things (in Matthew 6:25-34), we feel the need to work ourselves up about them. I love when Jesus says, "Can any one of you by worrying add a single hour to your life?" (v. 27). Doesn't that just bring home how pointless worrying is? Being dependent not only means trusting God to take care of us, but also acknowledging that we can't take care of ourselves. Kids aren't physically or financially able to care for their own needs. They are dependent on their parents to do for them what they can't do for themselves. We like to think we have it all together. We like to think we can take care of ourselves and do what needs to be done in our own lives. 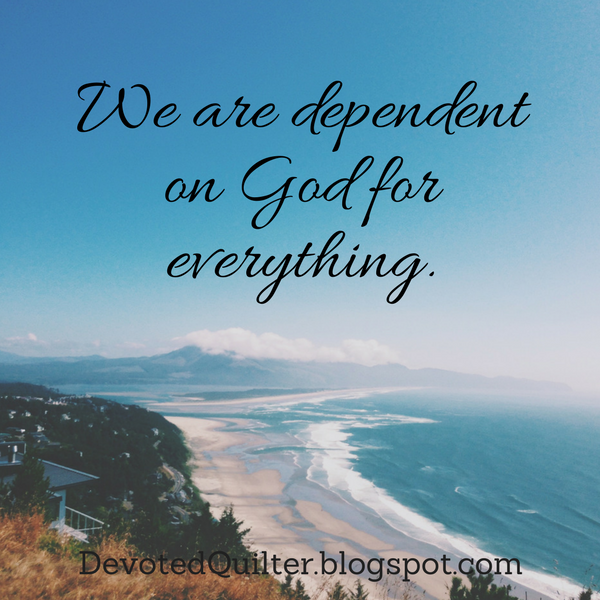 The truth of the matter, though, is that we are dependent on God for everything. Acknowledging that one simple fact can go a long way towards curing us of our worry habit. Like little children, we depend on our Father to care for us. And like the wonderful Father He is, He will. My mom's faith was like that - and she used to apologize for not being able to quote reams of scripture, or to be able to "debate" Biblical concepts... But she knew whose she was, and what He had done for her, and she trusted Him to the end!